"VIVA LA RETRO", baby!... Relive the retro in your life! For those old enough to remember, and still young enough to enjoy them this second time round.... the Ultimate Retro Gift Hamper is packed with goodies from the past!.. Consisting of that oldie but goody space hopper to help bounce away the brain cobwebs... stress buster Pacman to munch away those irritants... a rainbow coloured slinky spring to brighten up your day.. and 2 metal spud guns to relive more blasts from the past - literally!!.. 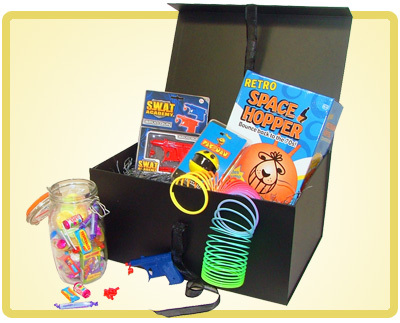 The ultimate hamper for the person who has everything... but who is happy reliving the past! !..